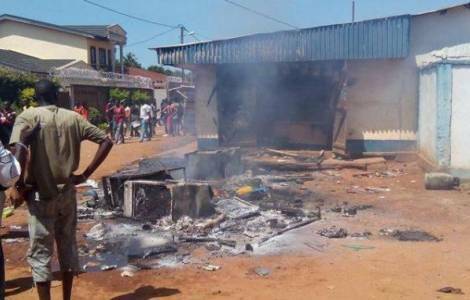 Bangui (Agenzia Fides) - "Do not stop to denounce the massacre of Christians. Ask yourselves why this happened", says His Exc. Mgr. Juan Jose Aguirre Muños, Bishop of Bangassou, diocese in the south-east of the Central African Republic, adjacent to that of Alindao, where on November 15 former Seleka rebels of the UPS (Unité pour la Paix en Centrafrique), under the orders of General Ali Darassa, killed more than 40 people, including the Vicar General of the diocese, Mgr. Blaise Mada, and Fr. Celestine Ngoumbango, parish priest of Mingala (see Fides 17/11/2018). "The event that triggered the massacre was the killing of a Nigerian mercenary of the UPC, a few days ago", recalls Mgr. Aguirre. "The members of the UPC are Peuls who come mostly from neighboring countries like Niger. The UPC, born from a division of Seleka, has been in Alindao for 5 years, in the west of the city. The Catholic mission is in the east, where the camp for displaced people for non-Muslims is located, which welcomes about 26,000 people". "The reprisal was terrible", says the Bishop. "The men of Ali Darassa assaulted, looted and set fire to the displaced camp and killed women and children; they burned down the cathedral where they killed the two priests. Immediately after the UPC mercenaries allowed groups of young Muslims of the western part to enter the eastern part of Alindao and looted the Bishop’s residence and burned the presbytery and the center of Caritas. I saw some photos. What remains of these structures are only the limed walls". Yesterday, the NGO staff working in Alindao were evacuated. "Everybody left except Mgr. Cyr-Nestor Yapaupa, Bishop of Alindao, and three priests who wanted to remain close to the population", underlines Mgr. Aguirre. "I spoke with them, they are exhausted, but they had the strength to bury the two priests and the 42 people massacred in the camp. I believe that tomorrow, Cardinal Dieudonné Nzapalainga, Archbishop of Bangui, intends to go to Alindao". Mgr. Aguirre confirms that the Blue Helmets of MINUSCA did not intervene to defend civilians from the UPC assault. "As soon as the attack began, the Mauritan Blue Helmets of MINUSCA withdrew to their base", he says. "Bear in mind that the rules of engagement of some contingents such as Mauritania, Egypt and Pakistan, have an agreement with the UN on the basis of which they respond to armed assaults only if attacked directly. Therefore the Blue Helmets were completely ineffective". "Other contingents such as that of Rwanda have rules of engagement on the basis of which they intervene to defend the population when there is a sign of an attack against them", the Bishop points out.